Platinum-recording artist Jewel headlines the inspiring biography of country music legend June Carter Cash in the Lifetime(R) biopic, Ring of Fire , arriving on DVD June 4 from Lionsgate Home Entertainment, only a few short days after its eagerly anticipated premiere on Lifetime(R). Based on the book Anchored In Love: An Intimate Portrait of June Carter Cash, penned by Cash's son John Carter Cash, Ring of Fire delves into the compelling history of the legendary singer/songwriter. The film also stars Francis Conroy (HBO's "Six Feet Under," TV's "American Horror Story") as Cash's mother, Maybelle Carter, and Matt Ross (TV's "American Horror Story," HBO's "Big Love") as Johnny Cash. June Carter Cash wrote Johnny Cash's most famous song, "Ring of Fire," while she was falling in love with the fascinating yet difficult musician. Ring of Fire explores that volatile relationship, as seen through the eyes of their son, John, as well as profiles the woman who patiently supported one of country music's biggest stars as she found her own idiosyncratic path to stardom. A born performer, June was country music royalty, as part of the Carter Family, whose music was heard all over America. Later, she and Cash performed onstage together and lived an exalted yet turbulent life, maintaining their lifelong bond and a semblance of a home life for their son, largely due to the strength and perseverance of June's great love. 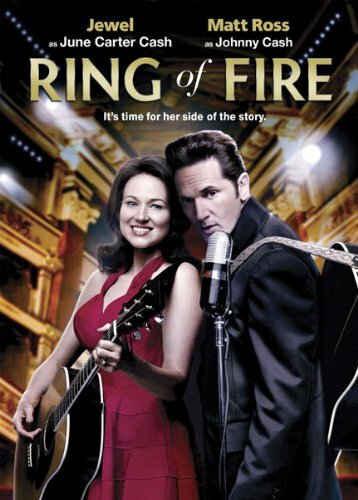 Ring of Fire takes fans beyond the portrayal of June as she was seen in Walk The Line, giving us more of her own colorful family history, her famous sense of humor and her pioneering role as one of the first ladies of country music. Ring of Fire DVD, including a full-length Biography(R) special on Johnny Cash, will be available for the suggested retail price $19.98.